Gents, you do not need to act tough when the cold weather comes around. Instead, you can save yourself from frostbite by picking out one of these mens gothic hoodies. Not only will they keep you feeling warm, but they will also provide you with your choice of gothic designs. Our selection of gothic pullovers includes a diverse array of designs that are bound to appeal to any guy out there. Almost all of our gothic hooded sweatshirts are made using heavy cotton, which provides both comfort and warmth, ensuring that you feel good and stylish when you wear them. Many are creatively designed, displaying bold gothic graphics on the front, back, and sleeves. 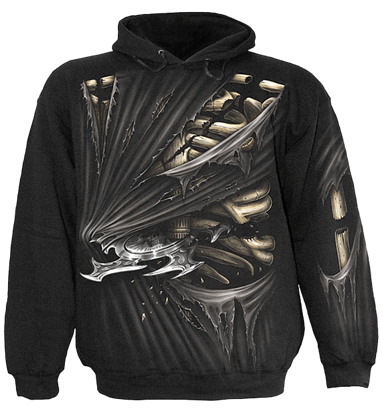 The dark prints on these gothic hoodies range from grim reapers to vampires to crosses to dragons to skulls and beyond, ensuring that no matter what type of gothic guy you are, you can likely find gothic outerwear that speaks to you here. The long cold winters will not affect your style so long as you shop here. This is one hoodie that you simply have to see to believe. Greyscale design does wonders for this Ascension Skull Hoodie, serving to give gothic design a monochromatic look that catches the eye, without being too overt or offensive. A new age calls for a new reaper. No longer does the reaper of souls carry a scythe. 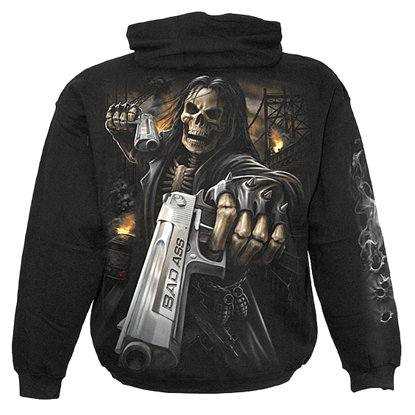 Instead, this assassin of souls favors more modern implements, and as this Assassin Hoodie shows, the new reaper is just as deadly as the old. Legend speaks of the monstrous dire wolf, the alpha of the pack, with blood red eyes and a craving for mortal flesh. The back of the Black Legend of the Wolf Hoodie displays a pair of snarling wolves on the sides of an ankh. 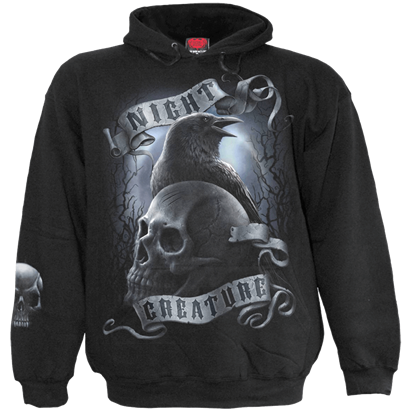 Declare yourself a creature of the night by wearing this spooky gothic hooded sweatshirt. 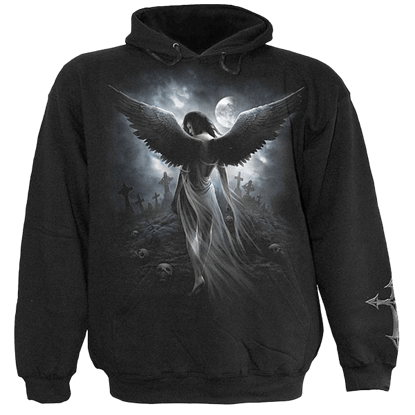 The Black Night Creature Hoodie displays an eerie midnight scene of a fog-filled, moonlit graveyard strewn with the skulls of the dead. As the saying goes, do not fear the Reaper. 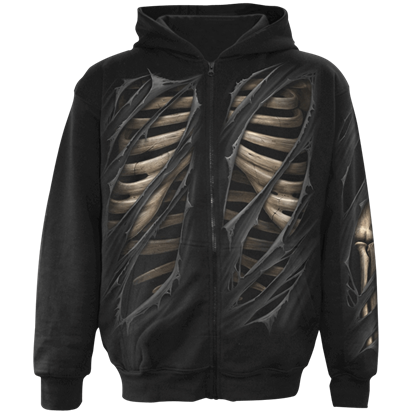 Instead, become the Angel of Death in this Bone Rips Zipped Hoodie! 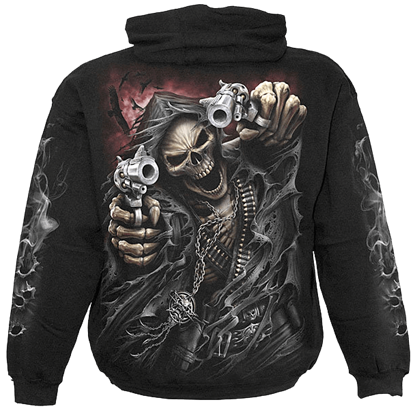 This comfortable and unique hoodie is a great way to embody the look of your favorite deadly figure with one simple zip. 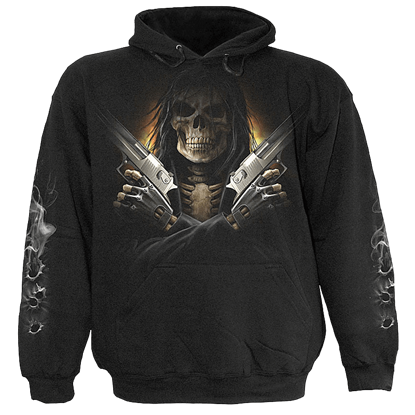 With a name like the Bone Slasher Mens Hoodie, you expect certain things about of the design of this garment. It does not fail to deliver, showing off a wicked design that has shredded fabric, razor sharp blades, and slashed bones. 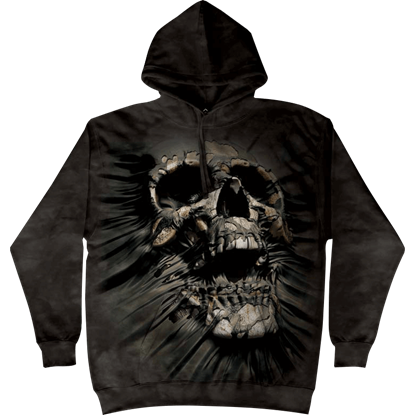 This Break Through Skull Hoodie features a human skull pushing through the front of the hoodie. 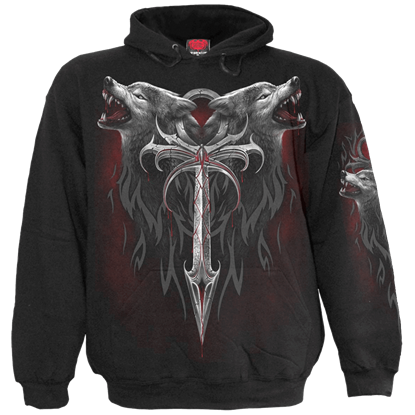 These medieval and fantasy style hoodies are super soft and have guaranteed exceptional color for years of wear. Be gone, evil spirit! 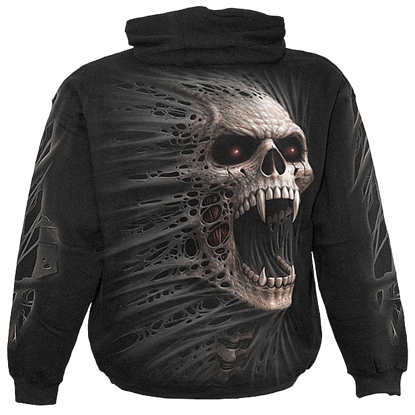 You will look like the recipient of an exorcism when you wear this Cast Out Hoodie, especially when people get a look at you from behind and see the vampiric skull as it emerges from the tatters in the design. Beware the Celt, for his warrior spirit is nigh indomitable! Want proof? 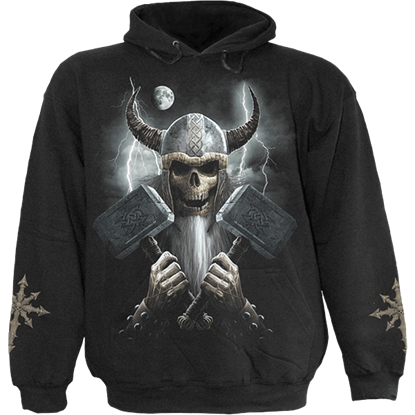 Look no further than this Celtic Warrior Hoodie, which shows off the raw power of the warrior, even as he rises from the grave to bring battle back to his enemies. The Cold Steel Mens Black Hoodie gives you a modern look at a Death that has updated his style a bit. The black cloak and cowl are traded in for leathers and biker gear, while the scythe has been switched out for a pair of pistols. 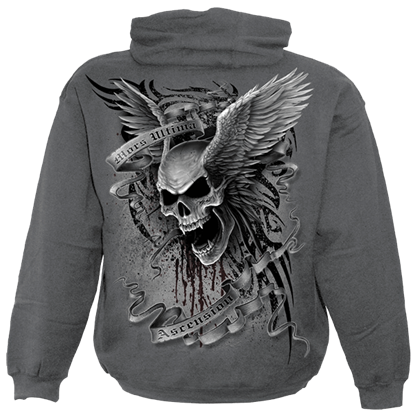 The Cold Steel Zip Up Hoodie gives you a more modern look at a Death that has updated his style. The black cloak and cowl are traded in for leathers and biker gear, while the scythe has been switched out for a pair of powerful pistols.